Textilene® 80% solar screen material provides the best combination of heat/UV blockage with the best outward visibility. Textilene® 80 Solar Screen Fabric is woven of extremely strong and durable PVC coated polyester yarns. The uniform weave design offers excellent outward visibility and good ventilation. 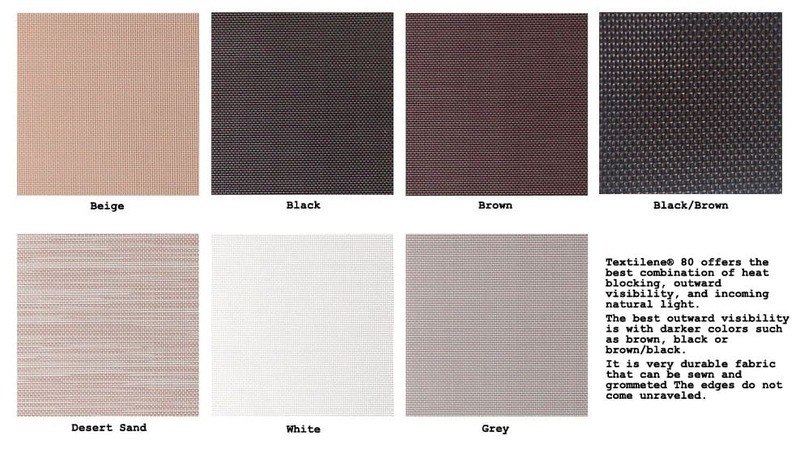 Shading is approximately 80% and Textilene® is available in a choice of six earth tone colors. The fabric is also pet resistant making it ideal for use in doors and full-length screen panels. Textilene® 80 is recommended in most applications. I purchased a 48" 100 foot roll of the textile 80 solar screen fabric. I cut the fabric into 8 and 1/2 foot lengths a by 21 1/2 " width. Using UV resistant thread I sewed cable sleeves on each end. 1/4" poly coated steel cable was run thru the sleeves and each 8' length was suspended between the rafters of the Pergola. The area provides a comfortable shady outdoor space . The filtered light allows for grasses to thrive and flowering plants grow very well. We are so very pleased with the Textilene 80 I highly recommend this product. I purchased a 100' roll of 80 solar screen to replace the standard screens in our sun room. The screens are 60" long and 46" wide and must be hung vertically. The roll came very well packaged without any damage during transit. The screening has provided us with reduced heat and glare in the room and good visibility overlooking the pool. A must with grandchildren. Advantages: Good quality fabric that suited our needs to a tee. Disadvantages: This is my first purchase of a large roll of screen and did not realize there would be a splice. However, it was not a problem to work around. Quality window screens is amazing. I have never had any issues with the materials, or tools all of which are professional grade. Some times some issues with the freight. Quality screens always goes above the call to make sure the carrier does their job. Or in any other customer service area. Disadvantages: none yet over the several years I have been ordering from these guys! Advantages: Our great room is cooler now. Order was fulfilled just as advertised and I am very happy with the product! Disadvantages: Could be a little more competitive on price! Seem to be very good product,but will know more next spring when I install it. The delivery went very well!! I re-screened all of my sunscreens (17) with Textilene 80. I wanted to match sliding door sunscreens made by a sunscreen company and this turned out to be the exact same material. It's a nice brown color that blends well and doesn't stand out. From the outside it looks very much like the window glass itself. It also provides for much better outward visibility than the old tan material I had. It's very convenient that Quality Screen sells it both by the roll and the lineal foot. 3' material worked for most of my screens so I bought a roll of that, but I needed 4' for a couple of screens so was able to purchase just the necessary footage for that. Advantages: Good quality. Convenient quantities available. Quality Screen was quick on shipping, and had a good product selection. Great transaction with no problems. Advantages: In So Cal, our house faces dead north, so the rear of our home is 100% exposure to the sun. In the summer, we need to protect from the blistering sun and heat. Textilene will be used to completely screen in our rear patio. Haven't installed it yet, but look forward to the relief. Samples appear to be just what we need.